URBANA -- With high temperatures and dry conditions prevailing during the corn grain-fill period this season, the risk of Aspergillus ear rot is high, said Carl Bradley, University of Illinois plant pathologist. 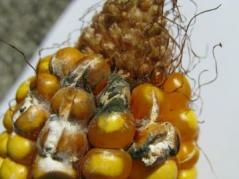 Aspergillus ear rot, caused by the fungus Aspergillus flavus, is observed as a yellowish-green mold growing on corn kernels. Areas within fields that have insect- and bird-damaged ears are particularly vulnerable to the rot. Aspergillus flavus produces aflatoxin, a carcinogenic mycotoxin that can be dangerous to animals if it is on the grain they consume. U.S. Food and Drug Administration (FDA) action levels for aflatoxin-contaminated corn grain are listed at http://www.fda.gov/Food/GuidanceComplianceRegulatoryInformation/GuidanceDocuments/ChemicalContaminantsandPesticides/ucm077969.htm#afla. Bradley recommends drying corn affected by Aspergillus ear rot to below 15 percent moisture immediately after harvest to prevent further mold development and aflatoxin accumulation. Long-term storage should be at slightly below 13 percent moisture. Cleaning grain after harvest may reduce the level of aflatoxin in the lot, because broken and cracked kernels tend to have higher levels of aflatoxin. Grain screenings should not be fed to livestock; they are likely to have high concentrations of aflatoxins. For more information about Aspergillus ear rot, aflatoxin, and other corn-ear molds and mycotoxins, the Plant Management Network’s Focus on Corn section has an on-line presentation by Charles Woloshuk (Purdue University) at http://bit.ly/RlmtmH.